With the tax-filing deadline just days away, California residents are worried that a slew of proposed levies on everything from soft drinks to water to tires and car batteries could soon see even more money going out of their pockets in the state that already has the nation’s highest income tax. As Californians grapple with that 13.3 percent income tax – and some leaner-than-usual refunds this year due to the recent federal tax overhaul – lawmakers in Sacramento are looking at a range of other revenue sources. Members of the legislature’s Democratic supermajority argue that these new taxes are vital to shore up the state coffers and to provide crucial services such as repairing crumbling infrastructure, cleaning up toxic wells and fighting obesity. The proposal, which if enacted would levy a fee of between 95 cents and $10 a month on residents’ water bills depending on meter readings, has divided members of Newsom’s own party. 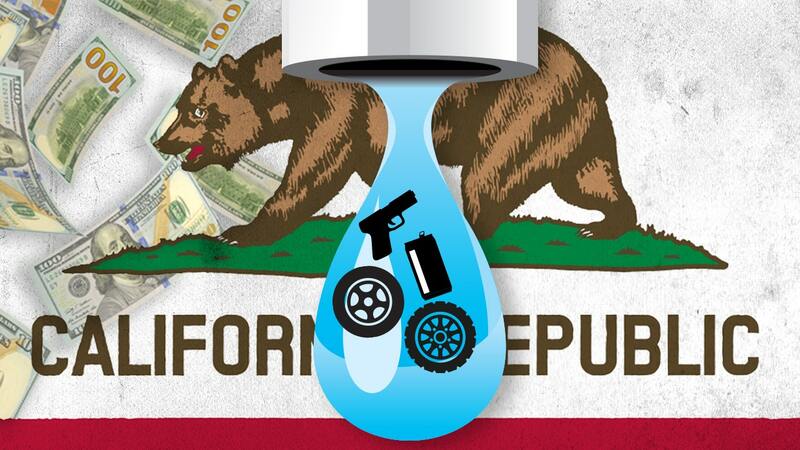 Tax and fee increases require support from two-thirds of lawmakers and, despite Democrats holding roughly 75 percent of the legislative seats in the state, some representatives from moderate and agricultural strongholds balk at the water tax idea. A recent Los Angeles Times report highlighting some of these tax proposals noted that polls show residents already think they’re overtaxed. Republicans and representatives of the beverage industry argue that the tax would unfairly hurt businesses and consumers, particularly those in lower-income communities. President Trump’s tax returns were front and center on Tuesday during a number of hearings on Capitol Hill. Following the formal request by House Ways and Means Chairman Richard Neal, D-Mass., for copies of the last six years of the president’s tax returns, Treasury Secretary Steve Mnuchin and IRS Commissioner Charles Rettig visited Capitol Hill, where they faced questions about when – and if – Trump’s returns would be handed over the Congress. Fielding questions from the House Appropriations Financial Services and General Government Subcommittee, Retting said that the final decision came down to him – with Mnuchin’s supervision. WHAT DID TRUMP ATTORNEY SAY IN LETTER OPPOSING DEMS’ TAX RETURN DEMAND? Rettig told a House panel Tuesday that the IRS was preparing a response to last week’s letter from Neal. During the 2016 campaign, Rettig defended Trump’s decision to break with decades of tradition by refusing to release his tax filings. Under questioning at his confirmation hearing last August, Rettig pledged to uphold the political independence of the IRS. Earlier in the day, Mnuchin told the House Appropriations Committee that his department intends to “follow the law” and is reviewing the request to hand over the returns. Mnuchin also revealed that Treasury Department lawyers have talked to the White House counsel’s office about releasing Trump’s returns, telling lawmakers that the consultations occurred before the request arrived last week. Mnuchin said the conversations were “purely informational,” and he has not been briefed on their content. But Mnuchin told a House panel that he has had no communication with the president or his top staff about the department’s decision on whether to provide Trump’s tax returns. “It is our intent to follow the law and that is in the process of being reviewed,” Mnuchin told a House Appropriations subcommittee with responsibility for his budget. Tuesday’s hearings come just two days after acting White House Chief of Staff Mick Mulvaney told “Fox News Sunday” in an exclusive interview that Democrats would “never” see President Trump’s tax returns. Mulvaney added that Democrats know they won’t get the returns, and “just want attention on the issue because they don’t want to talk to us about policy.” A fundamental purpose of tax law, Mulvaney continued, is to protect the privacy of tax filers. In framing his request for the filings, Neal relied on a 1924 statute that says the Treasury Department “shall furnish” them when requested. The IRS is part of Treasury. Trump has broken with tradition by not voluntarily releasing his tax returns. He routinely says — as he did Friday — that he’s under routine audit and therefore won’t release his returns. But IRS officials have said that taxpayers under audit are free to release their filings anyway. An obscure federal statute makes it legal for Congress to obtain President Trump’s tax returns for the last six years, and, through an additional loophole, can be made public, according to Judge Andrew Napolitano. During an appearance on “Fox & Friends” on Thursday morning, the senior judicial analyst explained that the Chair of the House Committee on Ways and Means can compel the IRS to reveal anyone’s tax returns, not just President Trump’s, for any time period without reason. However, they are generally required to be kept secret and confidential. The confidentiality of those records is a crucial part of the statute, in order to protect the privacy of the individual whom the records belong to. However, under certain circumstances, members of Congress can publicly reveal the records with immunity, Napolitano said. “If these tax returns goes to the House Ways and Means Committee, and any member of Congress gets them, that member of Congress can go to the floor of the House of Representatives, and the tax returns of the President of the United States become public,” Napolitano continued. Judge Nap predicted the attempt to obtain President Trump’s business and personal tax records will lead to a fight in court, because Treasury Secretary Steven Mnuchin will likely not want to reveal that information to Democratic lawmakers. “Mnuchin is not going to release it voluntarily, even though the statute says that he must,” Napolitano continued. If that’s the case, it could be months or even years before the issue of Trump’s tax returns is resolved. In a tweet Wednesday, U.S. Rep. Alexandria Ocasio-Cortez referred to a letter that Democrats wrote to the IRS, requesting six years of President Trump’s tax returns. In a tweet Wednesday, U.S. Rep. Alexandria Ocasio-Cortez, D-N.Y., suggested that House Democrats won’t be taking no for an answer in seeking access to President Trump’s tax returns. After Special Counsel Robert Mueller’s report on his Russia investigation found no evidence of collusion between the Trump campaign and Russia, some Democrats have been continuing efforts to investigate the president’s business dealings and other actions. Ocasio-Cortez’s tweet referred to the House Ways and Means Committee’s request to the IRS for six years of the president’s tax records. Congressional Republicans claim with their IRS request Democrats have “weaponized” the tax law. Living in New York is about to get more expensive and more difficult for many. Fox Business’ Charles Payne says New York politicians are desperate for money and looking for it any which way they can after passing a progressive budget Sunday. “Well I mean you know they’re spending a lot of money and they need to find it any way they can and look under every pillow cushion they could find,” Payne said on “America’s Newsroom” Monday. The budget, worked out with Gov. Andrew Cuomo, includes other agreements that will include two other dedicated revenue sources for the subways: a “mansion tax” on Manhattan homes that sell for $25 million or higher, and an internet sales tax levied on retailers who sell merchandise online. Payne was critical of the budget, saying it doesn’t really help New York grow. The Manhattan tolls plan, known as congestion pricing, will be the first of its kind in the nation with the billions the tolls are expected to raise going toward fixing New York City’s mass transit system. Payne believes politicians have ran out creative ways to keep promises to their constituents. 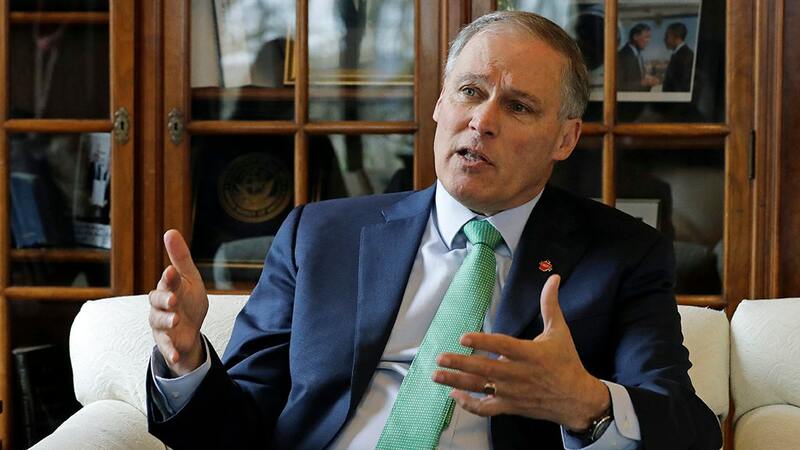 After releasing 12 years of tax returns on his campaign website, Washington governor and 2020 presidential candidate Jay Inslee urged President Donald Trump to do the same. Trump broke with decades of tradition by not releasing his tax filings during his 2016 campaign. He argued he couldn’t release his taxes because he was under an audit by the Internal Revenue Service, but being under audit is no legal bar to a candidate from disclosing taxes. Inslee announced his Democratic presidential bid earlier this month, which made him the first governor to enter an already-crowded field of senators and other hopefuls battling to challenge President Trump in 2020. Tax returns paint a fuller picture of a presidential candidate’s financial situation, from income and revenues to the effective tax rate they pay to charitable donations and overseas holdings. Sen. Kirsten Gillibrand of New York, became the first 2020 presidential candidate to unveil her 2018 returns when she disclosed the documents on Wednesday. The 2020 hopeful urged her rivals to follow in her footsteps and make their returns public, as Democrats continue to slam Trump for not releasing his returns during his 2016 presidential run. “Join me in calling on every presidential candidate to disclose their taxes. This is what transparency and accountability is all about,” Gillibrand said in a video. Another White House contender, Sen. Elizabeth Warren highlighted that she has released the past decade of her tax returns and like Gillibrand, has urged the other candidates to do the same. The Massachusetts Democrat has yet to release her 2018 returns. Her campaign told Fox News she will, once she files her 2018 returns. The tax filing season doesn’t end until April 15. On “Fox & Friends” Friday, Inslee also made the case for climate change. It is a topic his campaign is focused on with the goal of building “a national movement to defeat climate change,” according to Inslee’s website. “No more airplanes, no more cows, one car per family, one car, you are going to love that in Michigan,” Trump said at the rally. The Green New Deal, championed by Rep. Alexandria Ocasio-Cortez, D-N.Y., and Sen. Ed Markey, D-Mass., calls for the U.S. to shift away from fossil fuels such as oil and coal and replace them with renewable sources such as wind and solar power. It also calls for virtual elimination by 2030 of greenhouse gas emissions that have been tied to climate change. Trump’s jabs came days after 42 Democrats and Sen. Bernie Sanders, I-Vt., voted “present” on a non-binding resolution that would have begun debate on the Green New Deal. Not a single senator voted to break the filibuster, while 57 senators — including three Democrats and Sen. Angus King, I-Maine — voted “no.” In addition to Sanders, five Democratic presidential candidates who have previously backed the Green New Deal voted “present”: Kamala Harris of California, Cory Booker of New Jersey, Elizabeth Warren of Massachusetts, Amy Klobuchar of Minnesota and Kirsten Gillibrand of New York. Democrats described the vote, orchestrated by Senate Majority Leader Mitch McConnell, R-Ky., as a “sham vote” meant to avoid a genuine debate on the effects of climate change. Sen. Kirsten Gillibrand of New York disclosed her 2018 tax returns on Wednesday and Fox Business host Charles Payne said the 2020 Democratic presidential candidate benefited from President Donald Trump’s tax reform. 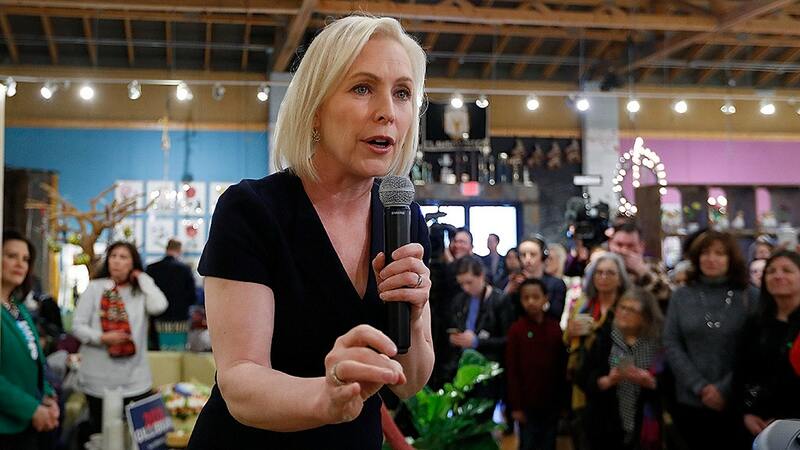 Gillibrand became the first 2020 presidential candidate to unveil her 2018 returns, which revealed how she fared following Trump’s 2017 tax overhaul. Gillibrand, who criticized Trump’s sweeping tax law in the past, reportedly got a significant tax cut. “The alternative minimum tax,” he said. “She was able to write off $10,000 as she would have to pay on this tax,” Payne said on America’s Newsroom Thursday. The alternative minimum tax (AMT) was designed to keep wealthy taxpayers from using loopholes to avoid paying taxes. Payne talked about the history of the tax referencing an article which said about 154 families in America who paid no tax in the 1960s. “People lost their minds, how dare them not pay anything?” Payne said. The Fox Business host added the alternative minimum tax was created to get that money from the people who didn’t pay any taxes. Gillibrand reported an adjusted gross income last year of just over $214,000, with nearly $168,000 coming from her Senate salary and most of the remainder from her book deal. The senator paid $29,710 in federal taxes, for an effective tax rate of 13.6 percent. Trump broke with decades of tradition by not releasing his tax filings during his 2016 Republican presidential campaign. Trump argued he couldn’t release his taxes because he was under an audit by the Internal Revenue Service, but being under audit is no legal bar to a candidate from disclosing taxes. According to a Fox News Poll released Wednesday, voters’ top tax concern isn’t how much they pay. Instead, they are most concerned about the rich not paying enough (34 percent) and the way the government spends the money (28 percent). About 1 in 10 say what bothers them most is the amount they pay (12 percent), too many people don’t have to pay at all (12 percent), and the complexity of the system (10 percent). Compared to 2014, the last time the question was asked, there has been an increase in voters who are troubled that the rich aren’t paying enough (+6 points). The shift in frustration comes mainly from self-identified liberals (+20) and voters under age 30 (+14 points). However, it’s not limited to traditional left-leaning groups — voters ages 65 and over (+14), voters earning $50k and over (+11), and whites without a college degree (+9) are also increasingly bothered by the wealthy not pulling their weight. Voters don’t entirely share Ryan’s view. Last month, the Fox News Poll found voters split over the new tax law: 34 percent favorable vs. 36 percent unfavorable. Thirty percent were unable to rate it. In addition, the new poll finds 55 percent of voters think their taxes are “too high,” and that’s about where that number has stood since the Fox News Poll first asked the question 15 years ago (2004). However, while the overall numbers held steady, a role reversal recently took place in the background. Consider this: The number of Democrats who say their taxes are too high is 59 percent. It was 49 percent in 2018 and 45 percent in 2017. That’s a 14-point increase since Trump won. An even bigger swing happened among Republicans — in the opposite direction. Sixty-eight percent said their taxes were too high in 2017 and 59 percent in 2018. Now, 50 percent feel that way. That’s an 18-point drop since their candidate won, and a 9-point decrease since passage of the GOP tax reform bill. Overall, 37 percent say their tax bill is “about right.” Three percent think they pay too little. Trump’s job performance on taxes has taken a hit since last year. In March 2018, more voters approved than disapproved of him on taxes by 2 points (48-46 percent). Today, he is underwater by 6 (42-48 percent). Drops in approval among independents (-12 points) and Democrats (-8) account for that downward shift. Trump receives his only net positive job rating on the economy (50 percent approve vs. 42 percent disapprove). He gets a net -2 on North Korea (42-44 percent), a -13 on immigration (41-54 percent) and -15 on health care (37-52 percent). Trump broke with decades-long precedence when he declined to release his tax returns during the 2016 presidential campaign. He continues to decline to make them public. But voters want transparency. Three-quarters overall (74 percent) and over half of Republicans (54 percent) believe that, in general, “the president of the United States” should be required to release his or her tax returns. Indeed, roughly equivalent numbers want that same transparency from “congressional leaders like the speaker of the house and senate majority leader” (76 percent) and “presidential candidates” (72 percent). New York Sen. Kirsten Gillibrand became the first presidential candidate to release her 2018 tax returns Wednesday challenging her rivals for the 2020 Democratic nomination to do the same. With the exception of Massachusetts Sen. Elizabeth Warren who, barring 2018, has released a decade worth of tax returns, none of the other candidates have released their own. The Democratic-led House passed a comprehensive proposal March 8 that would require the disclosure of presidential tax returns. New York City is expensive. From parking to hotels to Broadway tickets, the city has a way of leaving the wallet lighter for any visitor. But it’s poised to get even pricier if a controversial new “congestion” fee comes to fruition. With Democratic Gov. Andrew Cuomo’s backing, the proposed charge would be imposed at all Manhattan points of entry below 60th Street. While the price has not been set in stone, a report commissioned by Cuomo’s office recommends cars entering Manhattan during peak hours be charged $11.52, and trucks be charged $25.34 – on top of any bridge tolls. The hope is that the fees eventually would help ease traffic, while sending needed funds toward public transportation, notably the city’s aging subway system. But, on the heels of New York’s clash with Amazon that ended with the tech giant scrapping plans for a new headquarters there, the proposal is creating new economic concerns and political pushback. Democratic state Sen. Joseph Addabbo, who represents parts of Queens and Brooklyn, told Fox News that “businesses are very concerned” about the higher costs of entering Manhattan. Cuomo, in his State of the State address last month, said the tax would raise about $15 billion by 2024. New York City Mayor Bill de Blasio supports the legislation but is calling for hardship exemptions for those traveling to Manhattan for medical care – as well as upstate farmers who sell produce in Manhattan. Phase one, meanwhile, already has been enacted as New Yorkers riding below 96th Street started seeing increased prices in their taxis, Ubers and other rides for hire since Feb. 1: $2.50 for yellow cabs; $2.75 for Uber, Lyft and Juno; and 75 cents for ridesharing cars. Cuomo reportedly says the Metropolitan Transportation Authority can gain $1 million a day from the new surcharges. What comes next is not yet clear. Phase one only went into effect this month after a long legal battle. Phase two, which would extend to all drivers, would have to clear the state legislature – but could be a tough sell since the tax would affect any constituents who travel to the city. New York City Councilman Barry Grodenchik, a Democrat representing part of Queens, worried about the impact to his constituents, many of whom rely on cars to get into Manhattan. Supporters counter that the plan can work, and is sorely needed. A spokesman for New York state Democratic Sen. Liz Kruger, who represents Manhattan’s east side and supports the tax, told Fox News the senator remains optimistic and “the devil is in the details.” Kruger thinks there is “a model that can be found that is equitable to all New Yorkers,” the spokesman said. Democratic state Sen. Kevin Thomas, of Long Island, stressed the need to fund infrastructure repairs. “Much of my district commutes by train to the city, and improvements are desperately needed to the aging rail line,” he said, urging that most of the money go toward fixing the Long Island Railroad. Congestion pricing is not new. London has had an £11.50 surcharge since 2003, during working business hours. Los Angeles, too, is looking at a rush-hour toll system, with support from Democratic Mayor Eric Garcetti.